Each year the Sundays following Epiphany are a time for us to think about how God is known to us in Jesus Christ what that means as we live as his followers. We can never know everything about God, but through Jesus some of God’s mystery is explained for us, enough for us to be able to accept God’s love and respond. Today we remember the baptism of Jesus, as recorded in Luke’s gospel, which begins to pull back the curtain. I’m reading from Luke, Ch. 3, beginning with vs. 15. Listen with me to God’s holy word. My sister-in-law Tamara put my nephew Anthony (who turned 14 yesterday!) in swimming lessons when he was 18 months old. She did that because one day when she took him to the park, before she could catch him, he had his face in the lake, blowing bubbles. My brother Bruce, Anthony’s dad, taught himself to swim when he was about the same age. He just held his breath and paddled under water. One day my dad and uncle were fishing at Stony Lake up near New Era. One second Bruce was in the swimming area, the next he was by their boat, about 50 feet from shore. He swam like he was born with a life vest on—a fearless confidence that no matter how far or how deep he swam, he would be as safe in that water as he was on shore. When God created the heavens and the earth, God said, “Let the waters under the sky be gathered together in one place,” because nothing can do damage like water out of control. The drip drip drip of the kitchen faucet eventually wears a hole in the sink. The drip drip drip of water eventually wears a hole in rock. Water out of control is the image of chaos; so is the fire that consumed so much of Northern and Central California this year. Yet because life is what it is, chaos spills out of its cage every now and then. What’s so important for life on this planet can turn deadly in an instant. Along the Delaware River in Pennsylvania, there are high water marks on the stone edging the river—literally painted lines and dates—that tell the story of people who built their houses and plowed their fields and kept their animals close enough to the river to make it useful to them. Those marks tell of pain and suffering and loss of property and life. The marks tell the story of the lingering chaos of life that threatens to sweep each of us away—and too often succeeds. And yet those high water marks also tell a story of hope—of rescue and rebirth and renewal and rebuilding. The water came this high—and no higher. The worst is over. We saved what we could and got in the boat. At least we’re here to mark this mark and when the waters subside, which they will, we’ll start over. It’s bad now, but all will be well again. And yet don’t we all wish to be safe from such danger in the first place? Deep down, and maybe not so deep, I wish for a life set apart from the chaos of fire and water. I wish for a life without pain, without suffering, without illness and loss and insecurity and death. I wish for something magical—the mark of God on my forehead, a playful splash of baptismal water, a life vest that protects me from what life most often offers us. I wish—we wish—and yet Isaiah doesn’t say if you pass through the waters, if you walk through fire. Isaiah assumes the worst and says when. The flood will come, the fire will burn. There will be loss of property and loss of life, even if it’s just the loss of the way things used to be. But the marks are there—the survivors have seen the worst and lived to tell about it. Isaiah assumes the worst and hopes for something beyond our wildest imagination. God will be with us and no matter what we will be safe. We will be safe because, God says, “you are precious in my sight, and honored and I love you.” Baptism means we’ve been received not only into the fellowship and family of the church, it’s a sign and seal of our becoming part of Jesus Christ himself, as the gift of the Holy Spirit comes into our lives. But above all baptism is the sign and seal that says we do not belong to ourselves, we belong to God. Through baptism God claims and blesses us for a special life—one in which we’re challenged to leave the safety of the shore and step into sometimes murky waters. And baptism gives us our life vest, the fearless confidence that no matter how choppy the waters we swim in, no matter what fires we walk through, no matter what we are called to do, we will be safe because we are beloved. Look at where this confidence comes from in Jesus’ own baptism, as he entrusts himself to God. God refers to him personally—you are mine and you are beloved. Gabriel tells Mary the child she bears will be called Jesus, Son of the Most High. In Jesus’ baptism, God confirms that promise and adds “Beloved” to his name. In our baptisms we are named personally—as though a voice were calling from heaven, “you are mine and you are beloved.” God names and commissions Jesus for special work. Jesus is God’s beloved Son—another way of saying he is the Messiah, the Christ, the anointed one for whom Israel and the world had been waiting. In his baptism, Jesus is confirmed as God’s personal agent, God’s servant, who brings salvation to the world. Often we think of baptism as something that happens for our personal benefit, but like Jesus, our baptism benefits both the community of faith and the wider world. In our baptisms we are, like Jesus, commissioned—anointed as servants. We are given gifts to serve God and this world —some of us teach, some preach, some offer hospitality, some pray, some are elders, some are deacons. Some of us have many gifts, some have only one or two—but each of us is commissioned to serve this world, just as Jesus is. And Jesus could not do what he does without special strength, courage and power, so the Holy Spirit descends like a dove and gives him with the power he needs to carry out the work God gives him. In our baptisms, we, too, receive the power of the Holy Spirit to carry out the work God has given us, just as Jesus is. Before we even think about doing anything, we need to claim again the power and presence of God already in our lives. Before we put our faces into the water to blow bubbles, or head out the door to work or learn or shop or visit or volunteer, we better have our life vest on—the fearless confidence that whatever comes, we are safe because we are loved with a love that even goes to the cross for us. And once we’ve claimed that love, our task is to return it in our relationships with God and with each other. As we hear again that we are beloved, you and I are encouraged to keep reaching up to God in prayer and reaching out to serve those around us. Writing about baptism, David Lose says that our baptisms are meant to be remembered and renewed every day. Every time you wash your hands or run the dishwasher or step into the shower, you can remember your baptism by saying, “I am God’s beloved child, called and sent to make a difference in the world.” (workingpreacher.org, January 9, 2013) In love, God has claimed you and then given you all you need to be of service in this world. 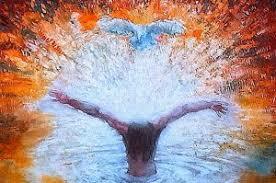 Baptism is your empowerment by the Holy Spirit. Baptism gives you the fearless confidence that nothing, not even the chaos of fire and water, will ever come between you and God’s love. As you leave the safety of the shore to plunge into whatever waters life presents you, you can trust that God’s love washes you clean and keeps you afloat. Will life be easy or perfect? Will you escape pain and trouble, even the inevitability of death? Of course not, but you will be blessed forever. And more than that, you will be a blessing.